Planners are all the rage now! Not that they haven’t been in the past, but with the advent of the Happy Planner (affiliate link) and other such kits, calendars, and more, they have become SUPER popular. And rightly so. It’s a whole lot more fun to plan when your planner is also a scrapbook page full of beautiful colors, stickers, and washi tape! Another not-so-new but new-to-me item is a traveller’s journal. These little strokes of genius have been around for ages… like history books ages. A traveller journal is simply a portfolio (usually leather) for the paper notebooks that explorers would carry with them to record field notes, tales of their adventures, etc. The journal made it easy to keep all their notebooks in one place as well as add more when needed. I first heard about these last year during the annual Homemaking Ministries Conference (affiliate link)–which is coming up by the way! Last year was awesome! It’s basically a ladies meeting, but it’s all online so you don’t have to travel, get a hotel room, etc! I cannot wait for this years conference to begin September 25th. It’s well worth every penny. Click the link above for more details! 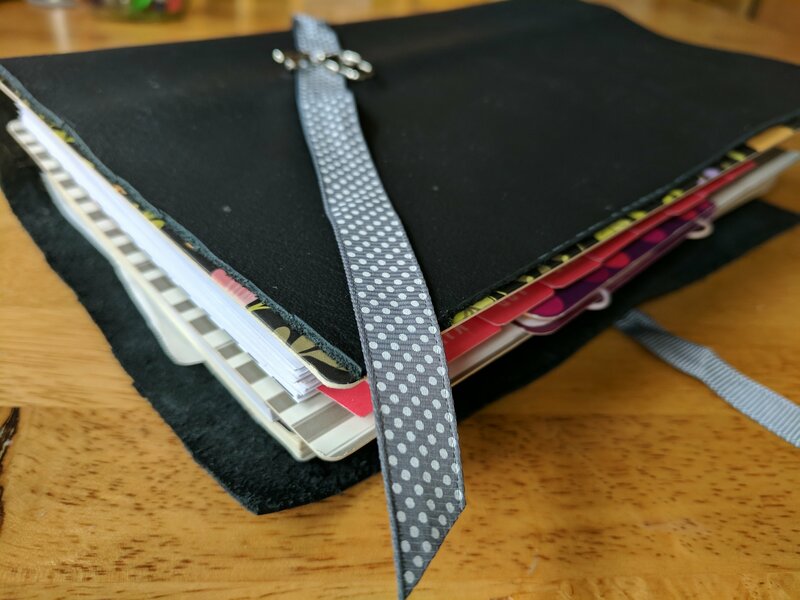 Anyway… one of the ladies who spoke at the conference used a traveller notebook as her portable planner (among other things… like grocery list, mini diary, devotion journal, etc.) I LOVED this idea! So I decided to make my own! (Because who wants to pay for something when you can make it? Although, if you are not a crafty person and would rather just buy one, Webster’s Pages Color Crush Journals are a really cute option! They have many different colors and sizes as well. 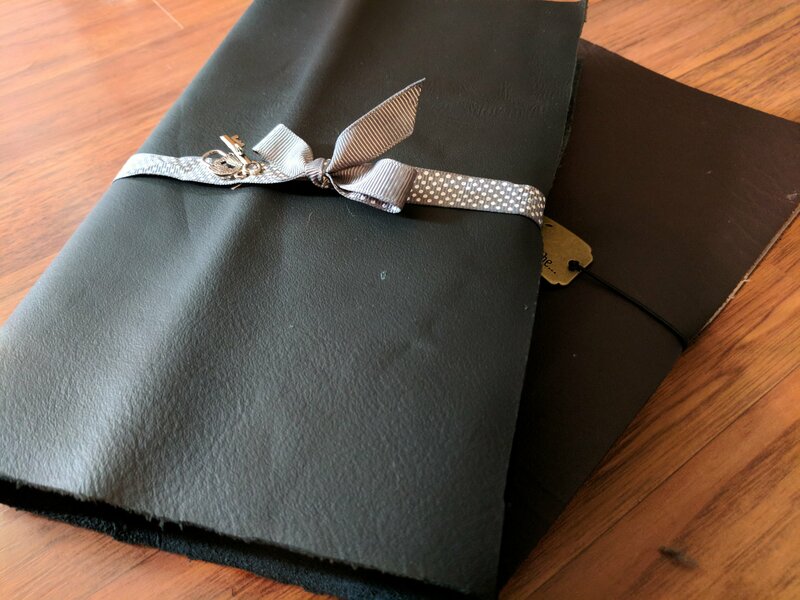 I’ve heard a lot of good things about this brand.–affiliate link) I like making my own notebooks because I’m cheap frugal. 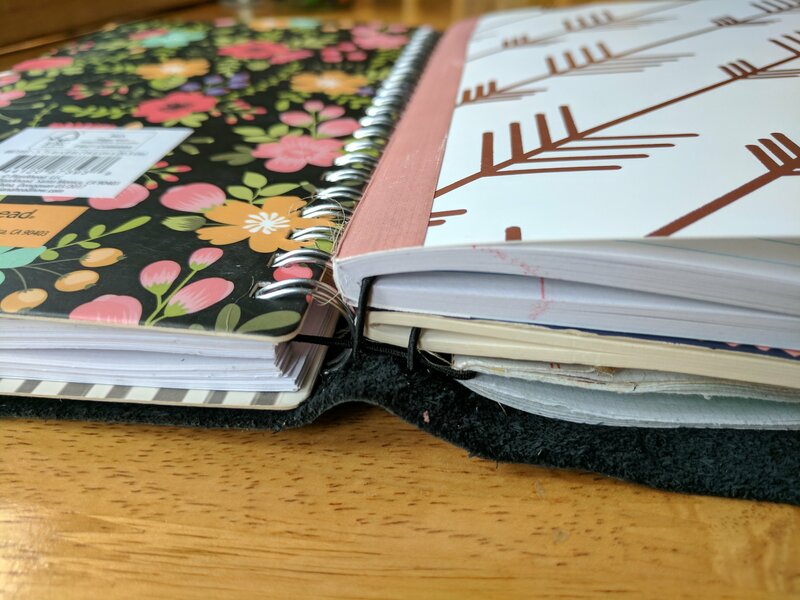 I have also used those cheap (and sometimes cute) composition notebooks from Walmart and cut them to the size I need (or you can get these colorful composition books that are already cut smaller–affiliate link). Anyway… on to the journal DIY. I recently made a second one that is a little bit different… simpler… than the first. I like both. I’ll share with you the things I learned along the way about each. The basic principle is the same for both. The variation comes in the details. So let’s get started with your basic traveller journal. If you’re making it out of leather, you will need some leather to start… 😜 I decided to go with one of these 3 lb. bags of scrap leather that you can get at Hobby Lobby. Just look the bag over really good before you buy to make sure there are some large pieces since every bag will be different. 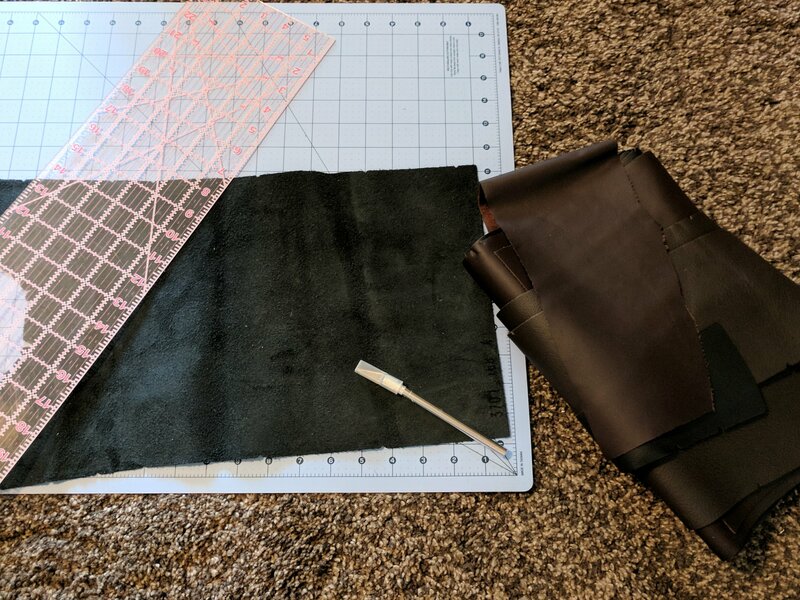 If you’d rather be safe than sorry, you can also purchase a large scrap of leather from hobby lobby or even get some faux leather by the yard in the fabric section of most craft stores. You will need to determine what size you want. 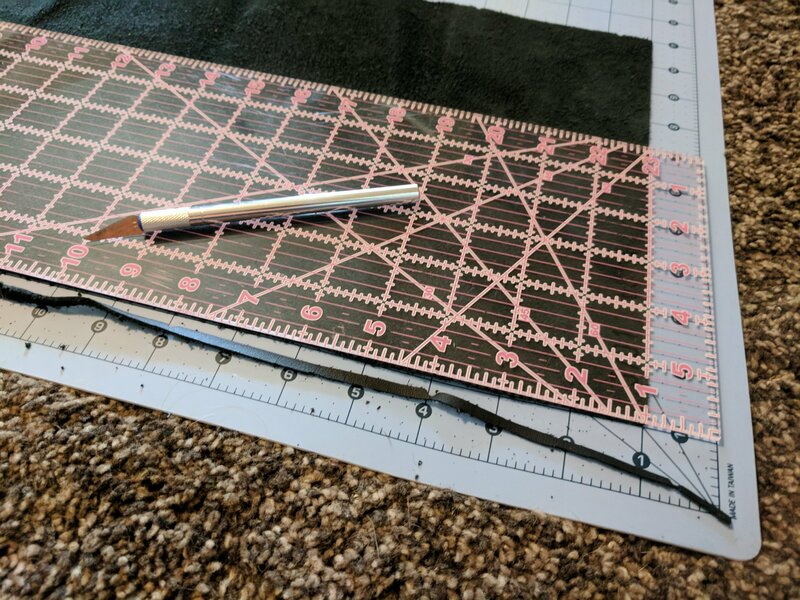 Like I said before, there are several sizes to choose from if you decide to purchase notebooks to fill it with (Etsy has TONS of really clever and cute options). If you know that you will only ever make or cut your own, then you can make it whatever size you want. 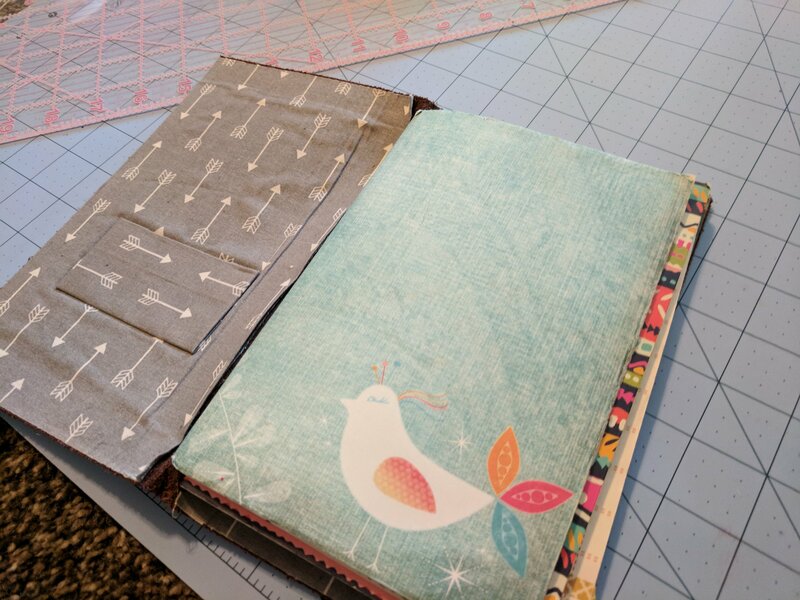 I usually make my notebooks 5″x8″, so I cut my leather into a 13″x9″rectangle to make room for additional books (something I failed to account for with my first attempt… after adding two or three notebooks they started hanging out the sides). 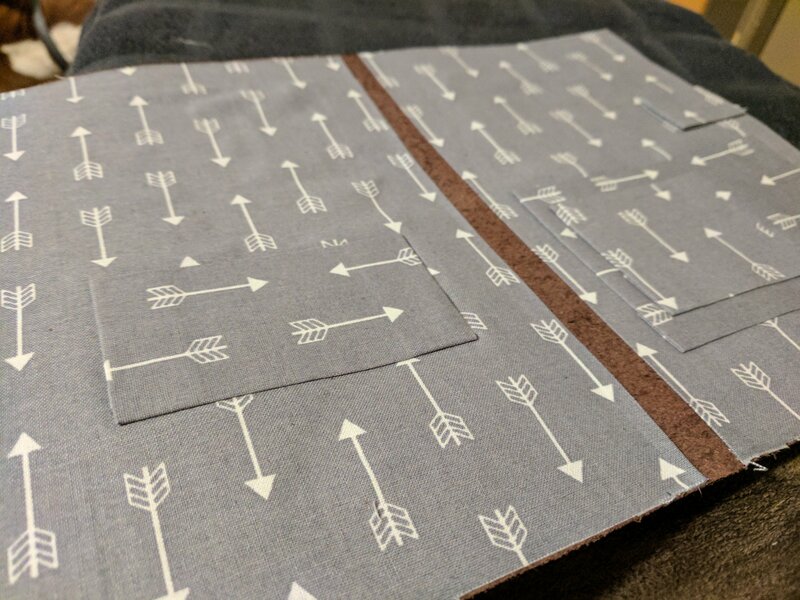 If you are wanting to line the inside of your leather with fun fabric, now is the time! 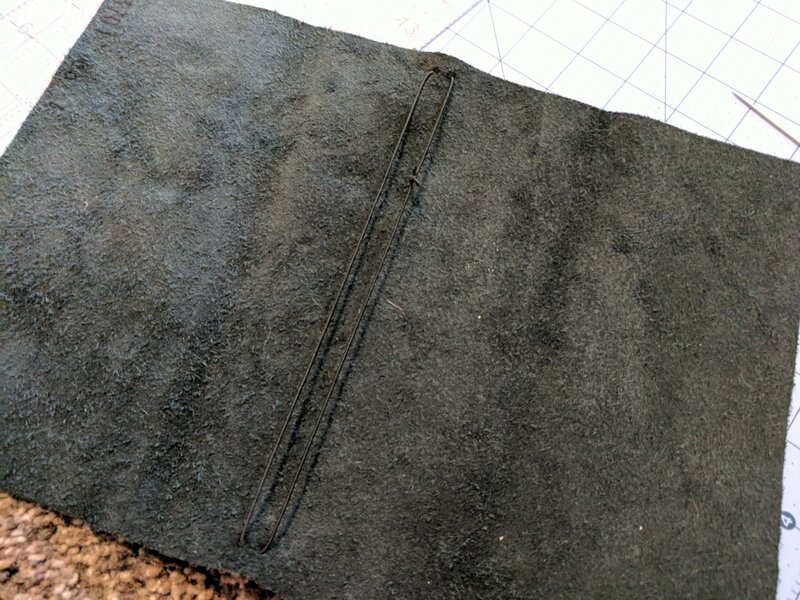 Cut your fabric the same size as the leather (I did mine a little differently… Don’t even remember why at this point) and follow the Heat ‘n’ Bond instructions to secure it to the back side of your leather. I got really creative and made pockets and a pen holder to add to mine. I simply folded the edges under and used Heat ‘n’ Bond to secure them. 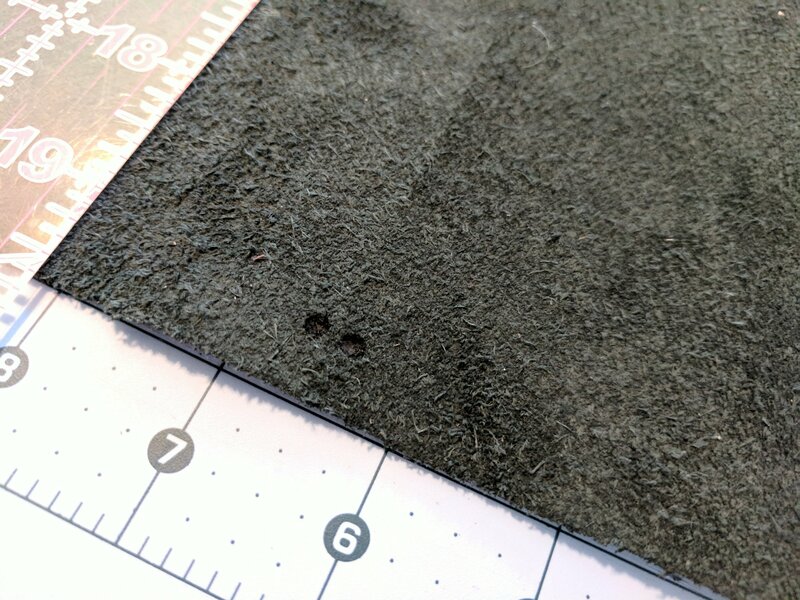 Next you’ll want to mark just to the left and right of center about 1/4″ from the top and bottom of the leather. Make one more mark dead center. These are where you will thread your elastic cord. I used a large needle to help pull it through, but I suggest making small holes with the tip of your knife first. 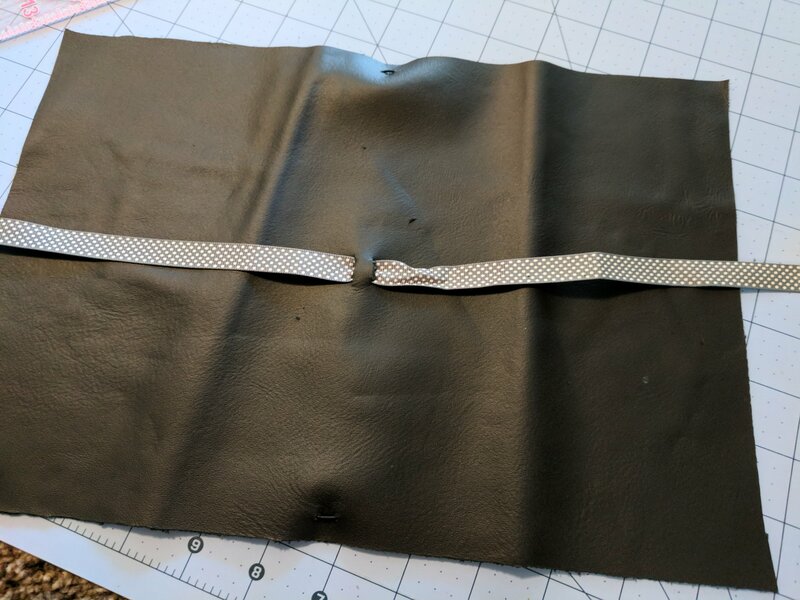 For the vertical elastic (this will hold your books in), thread the cord through as shown then tie off, being sure there isn’t much extra slack but not making it tight enough to pull on the leather. It should be able to lay flat. This isn’t an exact science, and I haven’t mastered it yet. It really only makes a slight visual difference in the final project if you get it too tight. For the elastic that will wrap around the outside and hold everything together, simply measure a piece of elastic about the same length as your leather is wide (in my case the elastic should be 13-13.5″) and push both ends of the elastic from the outside of the journal to the inside of the journal through your center hole and tie off (make the knot large enough that it won’t pull through. If you want to add an embellishment, do so before putting it through the hole and tying. 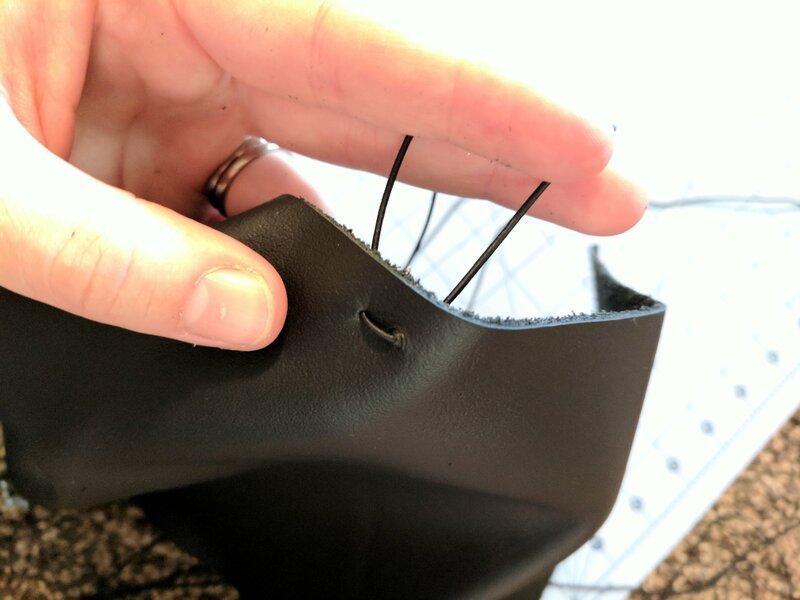 An alternate option is to use ribbon or a strip of leather for your closure. In this case, instead of making a hole in the center, make 2 small slits on either side of the center (like you did for the vertical cord) and thread your ribbon in and back out so you can tie it around the front. There you go! 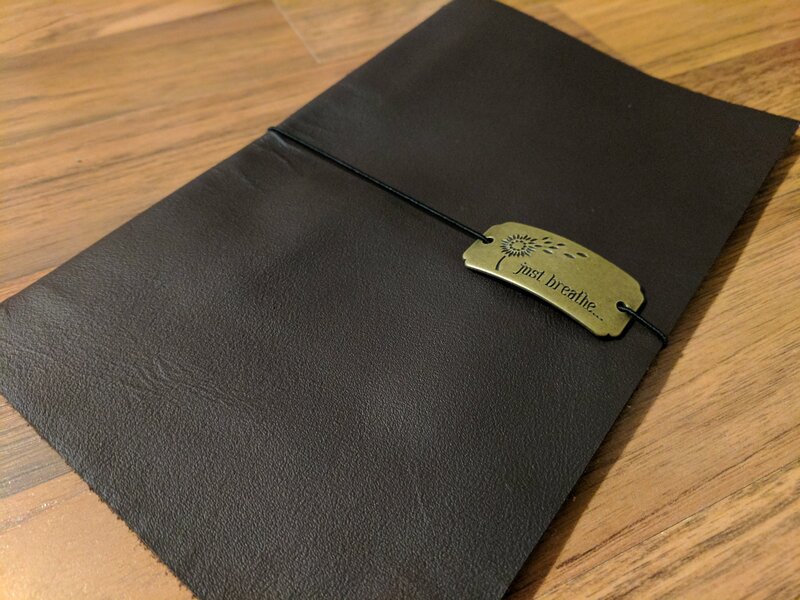 You made a traveller journal! Now all you need to do is add notebooks. Doing so is really simple. All you do is find the center of your notebook and slide it behind one of the vertical elastics like so. Need to add more than two notebooks? No problem. Make a loop of elastic cord. Put one notebook through the loop as usual. 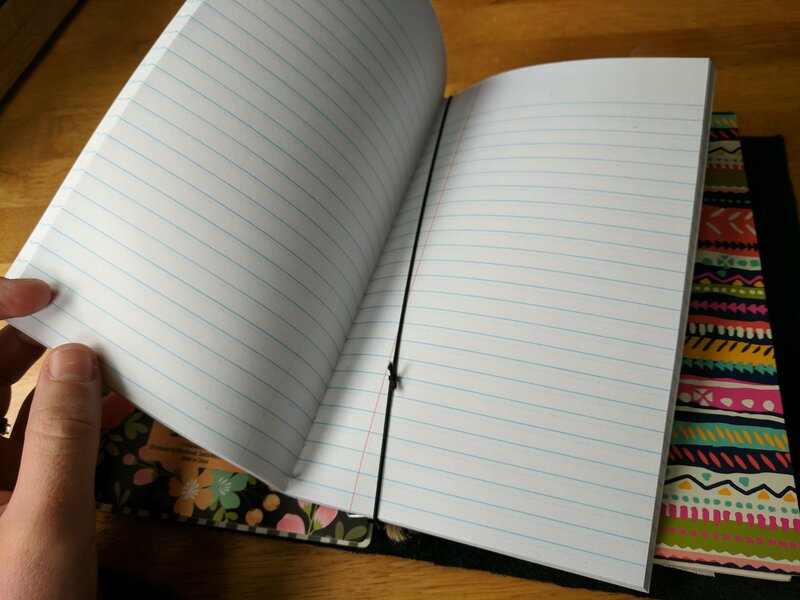 Slip the other loop through the center of a different notebook that is already present or thread it behind your existing notebooks and insert another new one on the other side. So, how do you organize your life? 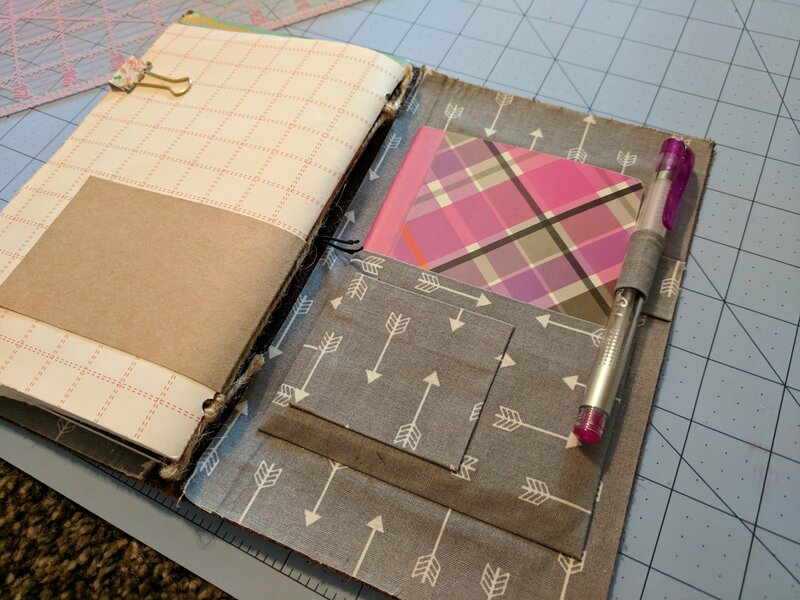 Do you think you could benefit from a DIY traveler’s journal? Previous Post What’s Your Gut Telling You?